The Village is open every day starting Sunday 8th of December 2013 till Monday 6th of January 2014 from 10:00am and 6:00pm and throughout the season, to welcome Students from schools, corporate events and individuals with special events every Sunday, Christmas Lunch and New Year’s Eve event in our new indoor venue “Draj el Ward”. Not to forget kids’ games. The guests can also make a tour in the Christmas decorated Village. The Christmas themed decoration features Santa’s house, Christmas authentic market and village workers such as smith, carpenter, potter, and cook preparing Kaak with cheese, Saj, copper polishing, hay chair making and wool gazing, workshops, ginger bread house making, Christingles making, tree ornaments, Christmas karaoke songs and photo shooting with Santa Claus in a beautiful setting. Entrance Fee: $10 per person. 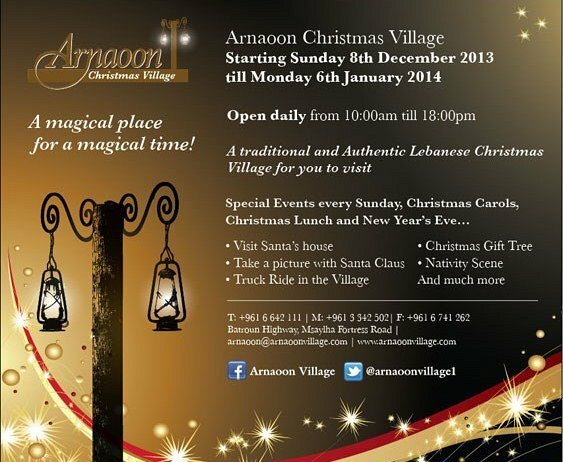 The Main objective of the “Arnaoon Christmas Village” was to take part of a Humanitarian and Social Act by offering gifts from sponsors and individuals to specialized associations such as SOS Village – Kfarhay for orphans, Akrem Abaka wa Ommak for elderly and Bonheur du Ciel for drug addicts in an event on the 22nd of December known as the “Boxing Day”.